Sometimes digging into a good book resource on healthy living can be exactly what the doctor ordered! Looking for natural answers to a chronic illness or condition? Open up ANY of Dr Mark Hyman's books, like The UltraSimple Diet or Ultraprevention or Ultrametabolism! Need meal planning help to get the whole family on board with your healthy eating? Pick up a copy of Amy Hendel's book, The 4 Habits of Healthy Families. Trying to break out of an eating disorder, food addiction, or shame around your weight? Grab a copy of Lose It For Life by Dr Linda Mintle & Stephen Arterburn or pick up Lysa Terkeurst's Made to Crave or Lisa Bevere's You Are Not Your Weight. With all there is to learn on this healthy living journey, ONE book is not enough! Choose from the multiple books out there and available to help you add healthy living tools and strategies to your toolbox! Or to help you overcome a mental block that may be holding you back from transformation. 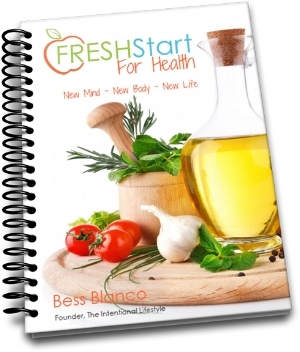 And of course, our book, the FRESH Start for Health Workbook, by yours truly, Bess Blanco, is a fabulous combination of lifestyle change help on faith, beginning fitness, food and our mindset! You can find it here on this website or by clicking HERE. Now, remember you can add these resources to your personal library little by little or even with a visit to your local library! I've found MANY of my awesome books (and this is only the smallest sampling) at yard sales, thrift stores and on discount websites online, gently used! What are YOUR favorite books on healthy living? We'd love to hear your recommendations in the comments below, or share them with us in our FRESH Start Online Community on Facebook! Every other Tuesday, we have a LIVE chat called #LetsTalkAboutitTuesday in our free healthy living support group on Facebook, and this video above was today's chat! You should join us to catch the next one! Enjoy this helpful video, and be sure to subscribe to the FRESH Start for Health channel on Youtube to continue getting our healthy living tips and encouragement!